Octave Electronics Kitten and Cat "SRM" synthesizer ad from page 67 of Contemporary Keyboard Magazine February 1980. Octave Electronics took what looks like a 16-month break from advertising in CK before running this ad from August 1979 until February 1980. The ad itself is quite different from all previous Octave Electronic ads - and it is all good. For the first time in CAT advertising history, you actually get to plant your eyeballs on AN ACTUAL CAT SYNTHESIZER! All past ads (going back more than two years), either used an illustrated representation of a CAT synthesizer or small and blurry synth-hero photos that didn't really give you a good idea of what a CAT synthesizer actually looked like. 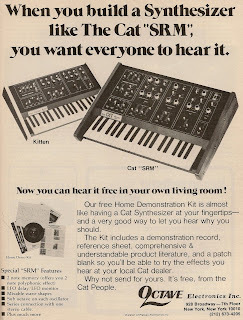 This ad not only features a great view of the CAT SRM and Kitten synthesizers, but for the first time also includes a free offer for a 'home demo kit' featuring a demo-record, reference sheet, patch blank and product literature. Oddly, there isn't a cut-away form of any kind to fill in your name and address to actually send in for the offer - but I almost don't mind since it makes more room for that large lovely photo. A hint to why Octave Electronics may have drastically changed its advertising strategy is visible near the bottom of the ad. If you look closely, you will see that the address of the company has changed to 928 Broadway, New York. More importantly, you will find this text in very fine print - "Division of Plateau Electronics Inc."
That's right! We are witnessing the beginning of the first of the mergers, acquisitions and name changes that eventually turned Octave Electronics into the company known today as Voyetra Turtle Beach, Inc. And with many mergers often comes shifts in marketing strategies. "In 1979, Octave merges with Plateau Electronics, a prominent synthesizer repair facility located in downtown Manhattan, the center of NYC’s music district. The company is renamed Octave-Plateau Electronics and, in addition to manufacturing synthesizers, becomes a popular synthesizer maintenance facility for professional musicians and recording studios in the NY metro area." So, this ad came out after the merger, but before the actual name change to Octave-Plateau. Almost as interesting is the fact that the current President & CEO, Carmine J. Bonanno, was the founder of Octave Electronics in 1975 - that is 35 years in the biz!